Energy Management Systems Standard offers a systematic approach for improving energy efficiency, enhances the use of sustainable energy sources and increases public awareness on saving energy. in all kinds of organizations. 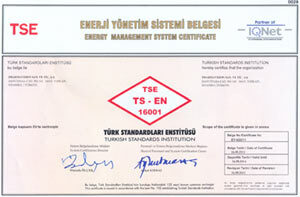 Some of the actions undertaken for a more efficient energy usage include: replacing energy-intensive equipment with energy-friendly counterparts, effective isolation, using energy-saving light bulbs, using commpressors with frequency converter for compressed air, training our associates in energy efficiency methods and practices thus raising their level of awareness.